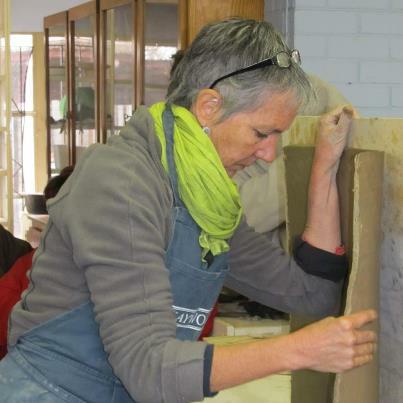 August has been an incredible month for the ceramic community of Gauteng. Feast or famine the saying goes and August has certainly been a feast of a month. Firstly 2 shows at the Everard Read Gallery and Circa. Southern Guild at the former and Wilma Cruise's The Alice Diaries at Circa. How wonderful it is to see ceramics playing a major role in exhibitions at fine art galleries. Both these excellent shows deserve to be seen. I was fortunate enough to attend the walkabout at Wilma's exhibition which gave me further insight into her work. It is rare to see exhibitions of this calibre and I urge you to see both if you are in the area. Also this month at the Kim Sacks Gallery we had the pleasure of Wendy Gers, renowned ceramic historian, hosting a session of Small Talk. These informal get-togethers are held regularly at the gallery and are an opportunity for conversation and debate. Over and above this was the selections for the Ceramics Southern Africa National Biennale and I had the privilege of attending a workshop presented by the visiting award judge Daphne Corregan. What an incredible day. I loved seeing the intuitive way she works and her obvious love for the clay and the possibilities it offers. What a month this has been, and what a joy to be a part of it. Good to hear your having a great month! Its good to hear ceramics having such an impact!